Bola Tinubu, national leader of the All Progressives Congress (APC), on Monday spoke angrily to Ogun state governor, Ibikunle Amosun. This might not be unconnected to the way the crowd at the APC presidential rally acted. The scene was captured in a recording seen by DAILY POST Monday night. 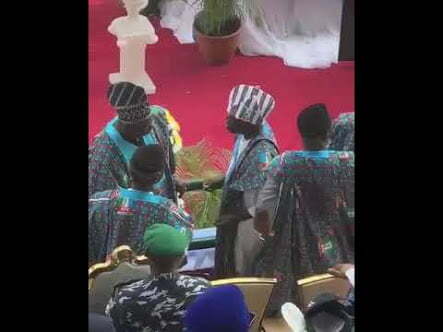 Amosun seemed to be trying to make an explanation to Tinubu. He later appeared to be begging the former Lagos governor to calm down. Many party members and supporters shouted at prominent leaders at the venue. President Muhammadu Buhari was shouted down at the event. Those who opposed Buhari were supporters of Governor Amosun. Some of them wore t-shirts with his image as well as Senatorial campaign posters. And as he urged party and supporters to vote for Abiodun, many of the party members replied “Nooooo”. This was greeted by more noise and the MC announced the end of the programme after an apparent signal. It was also clear that the event was cut short due to the charged atmosphere as the president’s security details totally shielded him during recitation of the national anthem. Earlier, Vice President Yemi Osinbajo, suffered similar fate as he was also booed for campaigning for Abidoun. As Osinbajo, who spoke in Yoruba, saying vote all APC candidates “all the way”, the crowed retorted “Noooo”. Amosun’s loyalists, including Akinlade, a fededal lawmaker, dumped the APC after the national leadership insisted that Abiodun (an oil mogul) won the primary.